Chemistry and Biochemistry Department Chair Purnendu "Sandy" Dasgupta finds a positive correlation between certain diseases and the presence of specific compounds in the breath. You arrive at the clinical laboratory with doctor’s orders for a laundry list of tests. The lab technician takes the paper and hands you a bright red balloon. You blow it up, twist it closed, hand it back and leave. There’s no need for urine samples, blood tests or other invasive procedures. The laboratory will analyze your exhaled breath and provide your doctor with a report on health conditions like diabetes and high cholesterol. That reality might not be too far away. Chemistry and Biochemistry Department Chair Purnendu “Sandy” Dasgupta finds a positive correlation between certain diseases and the presence of specific compounds in the breath. For example, the breath of a person with diabetes will be high in acetone. How ammonia changes in the breath upon protein intake is related to liver and kidney functions. A multitude of other correlations probably exist, just waiting to be discovered. Dr. Dasgupta recently published a paper on isoprene concentrations in the breath and how that correlates to the body’s production of cholesterol. This research may ultimately change the way coronary problems are diagnosed and treated. His interest in the correlation of compounds in the breath and health issues had its genesis in his two sons’ childhood asthma, a condition normally treated with inhalers. One inhaler, commonly known as a “rescue inhaler,” is used to mitigate an asthma attack. The other is a steroid inhaler, used regularly to treat inflammation that can cause attacks. There is a way to tell: Levels of nitric oxide in exhaled breath, which can be measured by a breath nitric oxide monitor, reveal the presence of inflammation. Unfortunately, that doesn’t completely solve the problem of steroid use. This pragmatic approach to complex programs defines his work. While exhaled air can be a tool in diagnosing and managing disease, the quality of inhaled air can be a major contributor to health problems. Dasgupta also studies air chemistry—the composition and origin for gases and particles in the air we breathe. Soluble gases in the air are mostly removed by the upper respiratory system, but the fine particles contained in the gases wind up in the lungs. 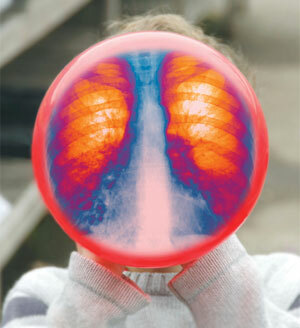 The human body takes in about 18,000 liters of air each day, more in weight than is taken in by food and drink. “And the lungs are much less able to handle insult than the stomach,” Dasgupta said. Discharges of hazardous gases into the atmosphere are not always monitored by regulatory agencies. Often it is an honor system, self-reported by the industry. Dasgupta recalls one incident where he discovered an unexplained but high concentration of arsenic in the air. Dasgupta has grants from the EPA and the National Science Foundation for studies examining the metal content of particulates in the air and arsenic in water. He is also conducting research on environmental perchlorate, a substance that inhibits the body’s iodine uptake. Iodine is an essential element necessary for brain development in children and proper thyroid functioning in adults. The deficiency is practically nonexistent in Japan, where people consume lots of products made with seaweed, which is high in iodine. In the United States, iodized table salt is the primary source. Environmental perchlorate comes from various sources: fireworks, road safety flares, a natural mineral in Chile that is widely used as fertilizer, even rocket fuel, which is mostly ammonium perchlorate. Each of the two solid fuel booster rockets on the space shuttle uses nearly a million pounds of ammonium perchlorate. Most of it is consumed on launch. But there are vast numbers of military missiles that need to replace their fuel every couple of years. Until recently, the practice was to simply dispose of the old fuel. Consequently, the groundwater near many military bases and perchlorate manufacturing facilities is severely contaminated. Moreover, a major plant near Las Vegas released large amounts of perchlorate into Lake Mead, which supplies water to California, including the water for much of the country’s vegetables. The EPA Web site reports confirmed perchlorate releases in at least 25 states and says it is working with other federal agencies, states, water suppliers and private industry to monitor perchlorate in drinking water and source water, as well as developing treatment technologies that can remove perchlorate from drinking water. One of Dasgupta’s projects examines the accumulation of perchlorate in breast milk. Before he and his team began their work, the last U.S. study of iodine content in human breast milk was in 1980. He published a study in 2005 that showed the content has decreased by a factor of almost three. A study now under way looks at how much iodine and perchlorate the baby takes in and if the baby’s assimilation of iodine is affected by the presence of perchlorate. Another attempt at finding a practical solution to a complex problem.